Falangism (Spanish: Falangismo) was the political ideology of the Falange Española de las JONS and, afterwards, of the Falange Española Tradicionalista y de las Juntas de Ofensiva Nacional Sindicalista (both known simply as the "Falange"), as well as derivatives of it in other countries. Falangism is widely considered a fascist ideology. 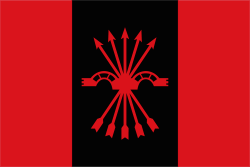 Under the leadership of Francisco Franco, many of the radical elements of Falangism considered to be fascist were diluted and it largely became an authoritarian, conservative ideology connected with Francoist Spain. Opponents of Franco's changes to the party include former Falange leader Manuel Hedilla. Falangism places a strong emphasis on Catholic religious identity, though it has held some secular views on the Church's direct influence in society, as it believed that the state should have the supreme authority over the nation. Falangism emphasized the need for authority, hierarchy, and order in society. Falangism is anti-communist, anti-capitalist, anti-democratic, and anti-liberal, although under Franco, the Falange abandoned its original anti-capitalist tendencies, declaring the ideology to be fully compatible with capitalism. The Falange's original manifesto, the "Twenty-Seven Points", declared Falangism to support: the unity of Spain and the elimination of regional separatism; the establishment of a dictatorship led by the Falange; utilizing violence to regenerate Spain; promoted the revival and development of the Spanish Empire; a social revolution to create: a national syndicalist economy that creates national syndicates of both employees and employers to mutually organize and control the economic activity, agrarian reform, industrial expansion, respect for private property with the exception of nationalizing credit facilities to prevent capitalist usury. It supports criminalization of strikes by employees and lockouts by employers as illegal acts. Falangism supports the state to have jurisdiction of setting wages. The Franco-era Falange supported the development of cooperatives such as the Mondragon Corporation, because it bolstered the Francoist claim of the nonexistence of social classes in Spain during his rule. The Spanish Falange and its affiliates in Hispanic states across the world promoted a form of panhispanism known as Hispanidad that advocated both cultural and economic union of Hispanic societies around the world. Some of the Falangists in Spain had supported racialism and racialist policies, viewing races as both real and existing with differing strengths, weaknesses, and accompanying cultures inextricably obtained with them. But unlike other racialists such the Nazis, Falangism is unconcerned about racial purity and does not denounce other races for being inferior, claiming "that every race has a particular cultural significance" and claiming that the intermixing of the Spanish race and other races has produced a "Hispanic supercaste" that is "ethically improved, morally robust, spiritually vigorous". It is less concerned about biological Spanish racial regeneration than it was in advocating the necessity of Spanish Catholic spiritual regeneration. Some, have, however, promoted eugenics designed to eliminate physical and psychological damage caused by pathogenic agents; and it did and still does supports natality policies to stimulate increased fertility rate among ideal physically and morally fit citizens. Primo de Rivera had little interest in addressing the "Jewish problem" outside areas of political issues. The Falange's position was influenced by the fact of the smallness of the Jewish community in Spain at the time that did not favour the development of strong anti-Semitism. Primo de Rivera saw the solution to the Jewish problem in Spain as simple, the conversion of Jews to Catholicism. However, on the issue of perceived political tendencies amongst Jews, he warned about Jewish-Marxist influences over the working classes. The Falangist daily newspaper Arriba claimed that "the Judeo-Masonic International is the creator of two great evils that have afflicted humanity: capitalism and Marxism". Primo de Rivera approved of attacks by Falangists on the Jewish-owned SEPU department stores in 1935. Falangism supports the establishment of a Falangist-led totalitarian one-party state. Falange's original manifesto, the Twenty-Seven Points called for a social revolution to create: a national syndicalist economy that creates national syndicates of both employees and employers to mutually organize and control the economic activity, agrarian reform, industrial expansion, respect for private property with the exception of nationalizing credit facilities to prevent excesive capitalist usury. Under Franco, the Falange abandoned its original anti-capitalist tendencies, declaring the ideology to be fully compatible with capitalism. 1 2 Stanley Payne. A History of Fascism, 1914–1945. Madison, Wisconsin, USA: University of Wisconsin Pres, 1995. Pp. 261. 1 2 3 Wayne H. Bowen. 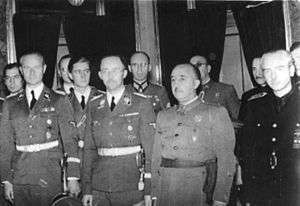 Spaniards and Nazi Germany: collaboration in the new order. Columbia, Missouri, USA: Missouri University Press, 2000. Pp. 152. 1 2 Stanley G. Payne. Fascism in Spain, 1923–1977. Madison, Wisconsin, USA: Wisconsin University Press, 1999. Pp. 281. 1 2 Hans Rogger, Eugen Weber. The European Right. Berkeley and Los Angeles, California, USA: University of California Press; London, England, UK: University of Cambridge Press, 1965. Pp. 195. 1 2 Benjamin Welles. Spain: the gentle anarchy. Praeger, 1965. Pp. 124. 1 2 Stein Ugelvik Larsen (ed.). Fascism Outside of Europe. New York, New York, USA: Columbia University Press, 2001. Pp. 120–121. 1 2 3 Roger Griffin (ed). Fascism. Oxford, England, UK; New York, New York, USA: Oxford University Press, 1995. Pp. 189. 1 2 Rodney P. Carlisle (general editor). The Encyclopedia of Politics: The Left and the Right, Volume 2: The Right. Thousand Oaks, California, USA; London, England, UK; New Delhi, India: Sage Publications, 2005. Pp. 634.